Michelmersh is a small village lying off the main road from Romsey to Stockbridge. 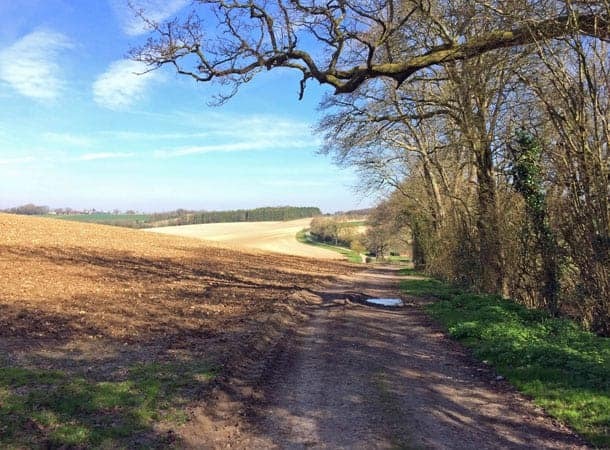 The walk included mixed woodland, downland and quiet country lanes. Starting from the church the entrance to the path was not obvious but was eventually discovered between a gate and an overgrown laurel bush leading along a very muddy path between trees and a boundary fence. The experience was similar to what Alice must have felt like going into the rabbit hole. Eventually the fence came to an end and sunlight penetrated the woodland floor. A Chiffchaff started to call followed by another a few trees away. A Wintering Blackcap joined in with a Wren calling from the undergrowth. Chaffinches, Blackbird, Thrush and Robin completed the orchestra to accompany what promised to be a very pleasant visit. Leaves are showing on some trees in towns and cities but in the countryside where it is slightly colder they have yet to appear. This allows light to fall on the woodland floor so that low growing plants can flower and produce seed. The woods and coppices alongside the path through Lower Eldon Farm were all carpeted in Celandines, Wood Anemones and Dogs Mercury or the leaves of yet to flower Bluebells. Sweet Violets grew along the sides of the path mostly of a deep purple colour but some of them formed patches of white. The white Violets all had a purple spur to the rear of the flower showing that they were sweet rather than dog violets. Speedwell grew on patches beside the path. When examined closely the light blue colour of the petals is made up of blue and white stripes and the petals fall off almost as soon as they are picked. The land in the immediate vicinity of Lower Eldon Farm was chalk downland with large fields of bare earth waiting for the spring crop to appear. The hoot of an Owl and the mewing of a Buzzard were the only sounds to be heard over the open landscape. A Kestrel floated silently onto its favourite perch on an old Oak tree where it could look down for prey in the ditch below. The path through Humbers Wood emerged onto the Kings Somborne to Braishfield road which was the northern extremity of the walk. Walking on the road is not normally a good idea but in this case moss in the centre of the road indicated that few cars used the road and in the event only one car passed in the whole two miles. This was one less than the two tractors that passed by on the outward journey. Primroses and Stitchwort flowered along the high banks at the side of the road and the purple spotted leaves of an orchid yet to flower was also seen. A selection of Goats were grazing in one field near the old Eldon Church but more animals could be seen at Manor Farm. In addition to Cows and Sheep the Geese and Turkeys kept watch for any intruders. Skylarks were heard over the open farmland and it was warm enough in the sheltered hollows for Red Admiral, Peacock and Brimstone butterflies to appear. The path back to the church at Michelmersh became narrower and less distinct so it was some relief when the churchyard and the end of the walk came in to view. Nevertheless the walk proved to be a very varied and worthwhile experience on a warm spring day.